It has been popular among women to make their hair soft and shiny since the 8th century Japanese Heian era. This non-drying oil keeps in an optimum moisture level? it protects your hair and skin from drying for a longer period of time, especially in the cold winter months. This product can be kept at hand for daily use to replenish the oils lost from the skin. As a skin care conditioner, it is an excellent natural moisturizer and emollient (skin softener), protecting skin from chafing and drying out, and replenishing vital nutrients. It restores skin’s pH balance and shields skin from penetration of environmental pollutants, and acts as a natural sun block by forming a barrier against harmful UV rays. Camellia oil is light enough as daily facial and body moisturizer. Apply 3-4 drops to damp skin for optimal results. Massage gently and thoroughly in circular motion until completely absorbed. Used regularly around the eyes and mouth, Camellia oil softens skin, diminishes small wrinkles, restores damaged skin and protects against age-spots and unwanted pigmentation. As a hair and scalp conditioner, Camellia oil supplies nutrients to the scalp and gently protects hair by replenishing vital nutrients which do not readily oxidize and deteriorate. Camellia oil softness hair and is especially effective on dry scalp and stiff hair. For best results, use only a few drops and apply to towel-dry damp hair. Put 3-4 drops in your palm, rub your hands together and run through hair to distribute the oil. Massage the oil into hair and over scalp. Wrap your hair with a warm towel for 15-20 minutes. 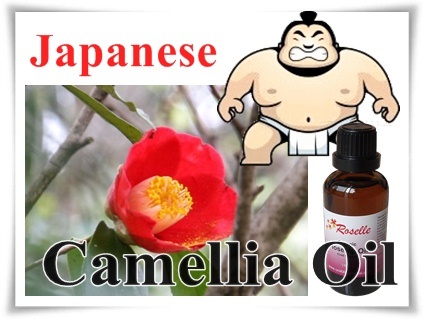 if you have long hair, you can use camellia oil on the ends of your hair.. This area is where most splits and breakages start. Use just a few drops on the ends as a leave-in, and your hair will feel soft and silky. Use once or twice a week in the beginning, and adjust the frequency to your needs as you go along. Camellia oil is an excellent emollient (skin softener), It soothes and softens rough, chafed or irritated skin and works great on dried rough skin such as in the heel area. For men, Camellia oil is an excellent skin conditioner after shaving, Applied regularly it will leave skin moisturized, and help with preventing irritations and shaving burns. Apply 3-4 drops to damp skin after shaving and massage gently until completely absorbed. Camellia oil protects skin from harmful UV and environmental damage, forming a thin shield against strong sun rays and change of temperatures. It also known to protect from age spots, freckles and excessive pigmentation. It is safe to use around eyes to prevent from crowfeet and mimic lines. Camellia oil is ideal for face massage due to its fast absorbency and light, velvety consistency. e.g. Shampoo, Conditioner, Lotion and Soap. Can it helps to darken grey or white hair? - perhaps user of Camellia Oil can help to share this.